Oceans cover 70 percent of Earth's surface, host a vast variety of geological processes responsible for the formation and concentration of mineral resources, and are the ultimate repository of many materials eroded or dissolved from the land surface. Hence, oceans contain vast quantities of materials that presently serve as major resources for humans. Today, direct extraction of resources is limited to salt; magnesium; placer gold, tin, titanium, and diamonds; and fresh water. These mounds of sea salt were mined from deeply buried beds deposited when sea water evaporated in an ancient environment. The beds were preserved by being covered and then uplifted in a modern terrestrial setting. 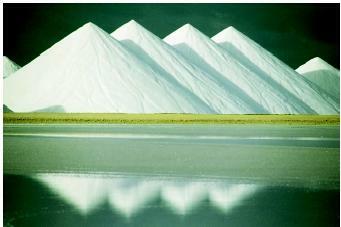 Mining accounts for most of the annual salt production, even though it also can be obtained by evaporating ocean water. resources. Yet the increasing population and the exhaustion of readily accessible terrestrial deposits undoubtedly will lead to broader exploitation of ancient deposits and increasing extraction directly from ocean water and ocean basins . Resources presently extracted from the sea or areas that were formerly in the sea range from common construction materials to high-tech metals to water itself. Chemical analyses have demonstrated that sea water contains about 3.5 percent dissolved solids, with more than sixty chemical elements identified. The limitations on extraction of the dissolved elements as well as the extraction of solid mineral resources are nearly always economic, but may also be affected by geographic location (ownership and transport distance) and hampered by technological constraints (depth of ocean basins). The principal mineral resources presently being extracted and likely to be extracted in the near future are briefly considered here. Salt, or sodium chloride, occurs in sea water at a concentration of about 3 percent and hence constitutes more than 80 percent of the dissolved chemical elements in sea water. The quantity available in all the oceans is so enormous that it could supply all human needs for hundreds, perhaps thousands, of years. Although salt is extracted directly from the oceans in many countries by evaporating the water and leaving the residual salts, most of the nearly 200 million metric tons of salt produced annually is mined from large beds of salt. These beds, now deeply buried, were left when waters from ancient oceans evaporated in shallow seas or marginal basins, leaving residual thick beds of salt; the beds were subsequently covered and protected from solution and destruction. Like the sodium and chlorine of salt, potassium occurs in vast quantities in sea water, but its average concentration of about 1,300 parts per million (or 0.13 percent) is generally too low to permit direct economic extraction. Potassium salts, however, occur in many thick evaporite sequences along with common salt and is mined from these beds at rates of tens of millions of metric tons per year. The potassium salts were deposited when sea water had been evaporated down to about one-twentieth of its original volume. Magnesium, dissolved in sea water at a concentration of about 1,000 parts per million, is the only metal directly extracted from sea water. Presently, approximately 60 percent of the magnesium metal and many of the magnesium salts produced in the United States are extracted from sea water electrolytically. The remaining portion of the magnesium metal and salts is extracted from ancient ocean deposits where the salts precipitated during evaporation or formed during diagenesis . The principal minerals mined for this purpose are magnesite (MgCO 3 ) and dolomite (CaMg[CO 3 ] 2 ). The ocean basins constitute the ultimate depositional site of sediments eroded from the land, and beaches represent the largest residual deposits of sand. Although beaches and near-shore sediments are locally extracted for use in construction, they are generally considered too valuable as recreational areas to permit removal for construction purposes. Nevertheless, older beach sand deposits are abundant on the continents, especially the coastal plains, where they are extensively mined for construction materials, glass manufacture, and preparation of silicon metal. Gravel deposits generally are more heterogeneous but occur in the same manner, and are processed extensively for building materials. Limestones (rocks composed of calcium carbonate) are forming extensively in the tropical to semitropical oceans of the world today as the result of precipitation by biological organisms ranging from mollusks to corals and plants. There is little exploitation of the modern limestones as they are forming in the oceans. However, the continents and tropical islands contain vast sequences of limestones that are extensively mined; these limestones commonly are interspersed with dolomites that formed through diagenetic alteration of limestone. Much of the limestone is used directly in cut or crushed form, but much is also calcined (cooked) to be converted into cement used for construction purposes. Gypsum (calcium sulfate hydrate) forms during evaporation of sea water and thus may occur with evaporite salts and/or with limestones. The gypsum deposits are mined and generally converted into plaster of paris and used for construction. The deep ocean floor contains extremely large quantities of nodules ranging from centimeters to decimeters in diameter (that is, from less than an inch to several inches). Although commonly called manganese nodules, they generally contain more iron than manganese, but do constitute the largest known resource of manganese. Despite the abundance and the wealth of metals contained in manganese nodules (iron, manganese, copper, cobalt, and nickel), no economic way has yet been developed to harvest these resources from the deep ocean floor. Consequently, these rich deposits remain as potential resources for the future. Terrestrial deposits of manganese are still relied on to meet human needs. Complex organic and inorganic processes constantly precipitate phosphate-rich crusts and granules in shallow marine environments. These are the analogs (comparative equivalents) of the onshore deposits being mined in several parts of the world, and represent future potential reserves if land-based deposits become exhausted. Metal Deposits Associated with Volcanism and Seafloor Vents. Submarine investigations of oceanic rift zones have revealed that rich deposits of zinc and copper, with associated lead, silver, and gold, are forming at the sites of hot hydrothermal emanations commonly called black smokers. These metal-rich deposits, ranging from chimneyto pancake-like, form where deeply circulating sea water has dissolved metals from the underlying rocks and issue out onto the cold seafloor along major fractures. The deposits forming today are not being mined because of their remote locations, but many analogous ancient deposits are being mined throughout the world. Placer Gold, Tin, Titanium, and Diamonds. Placer deposits are accumulations of resistant and insoluble minerals that have been eroded from their original locations of formation and deposited along river courses or at the ocean margins. The most important of these deposits contain gold, tin, titanium, and diamonds. Today, much of the world's tin and many of the gem diamonds are recovered by dredging near-shore ocean sediments for minerals that were carried into the sea by rivers. Gold has been recovered in the past from such deposits, most notably in Nome, Alaska. Large quantities of placer titanium minerals occur in beach and near-shore sediments, but mining today is confined generally to the beaches or onshore deposits because of the higher costs and environmental constraints of marine mining. The world's oceans, with a total volume of more than 500 million cubic kilometers, hold more than 97 percent of all the water on Earth. However, the 3.5-percent salt content of this water makes it unusable for most human needs. The extraction of fresh water from ocean water has been carried out for many years, but provides only a very small portion of the water used, and remains quite expensive relative to land-based water resources. Technological advances, especially in reverse osmosis , continue to increase the efficiency of fresh-water extraction. However, geographic limitations and dependency on world energy costs pose major barriers to large-scale extraction. SEE ALSO ; Mineral Resources from Fresh Water ; . Craig, James R., David J. Vaughtan, and Brian J. Skinner. Resources of the Earth: Origin, Use, Environmental Impact, 3rd ed. Upper Saddle River, NJ: Prentice Hall, 2001. Lahman, H. S., and J. B. Lassiter III. The Evolution and Utilization of Marine Mineral Resources. Books for Business, 2002. USGS Minerals Information: Mineral Commodity Summaries. U.S. Geological Survey. <http://minerals.usgs.gov/minerals/pubs/mcs/> . USGS Minerals Information: Minerals Yearbook. U.S. Geological Survey. <http://minerals.usgs.gov/minerals/pubs/myb.html/> . I never knew this much about the resources we get. The band is just fantastic that is really what I think. Oh by the Way, Which one's Pink? is it possible to extract calcium from sea corals?